An Edmonton police officer denies uttering Islamophobic slurs and repeatedly punching a suspect who is now suing him for damages. Const. Nathan Downing denies repeatedly punching Nasser El Hallak in a recently filed statement of defence. Const. 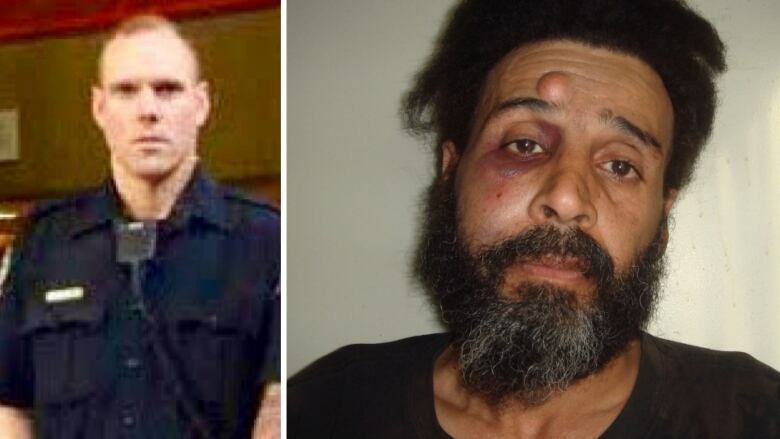 Nathan Downing is being sued by Nasser El Hallak, who has accused the officer of punching him multiple times, resulting in facial fractures and nerve damage to his face, hand and wrist. In his statement of claim filed in March 2017, El Hallak accuses Downing of calling him a "f--king n---er" and saying something like: "You f--king Muslim, you're killing our people and you think you can have a decent life? I'm going to make your life miserable." El Hallak is seeking $200,000 in damages. "Const. Downing specifically denies that he struck the plaintiff numerous times or that he assaulted the plaintiff while he was in handcuffs in the back of the police vehicle," the officer's lawyer said in a statement of defence filed Nov. 30. Downing was accompanied during the March 2015 arrest by Const. Nicholas Talvio. Both officers deny all the allegations made by El Hallak, including yelling racial or Islamophobic slurs at him. The two constables are among seven officers named in the lawsuit. El Hallak also accuses Rod Knecht of negligence, saying the former police chief knew "Downing had a propensity for violence." Six months after the incident, Downing was found guilty of using excessive force during an unrelated arrest. Documents show that Downing tried to stop a fleeing suspect on June 23, 2013, by using the police van he was driving to cut the man off. The suspect's ankle was broken. A disciplinary hearing related to the incident that involved El Hallak is expected to be heard in May. According to the statement of defence, Downing and Talvio say they saw a Chevrolet Silverado change lanes without signalling back in March 2015. The officers said when they turned on the police vehicle's emergency lights, the driver accelerated and pulled into a parking stall, then drove up on a curb. The driver got out and ran away, so Downing chased after him, yelling for him to stop, the defence statement said. Downing tackled El Hallak and during a struggle "in an effort to gain control" the officer "delivered one punch" to El Hallak's face, the document said. El Hallak was charged with impaired driving and obstructing a police officer, for allegedly refusing a breathalyzer. Those charges were later withdrawn by the Crown. The officers say they put a spit mask on El Hallak after he twice spat blood inside the police vehicle, despite being told to spit it outside. Police deny El Hallak suffered the alleged injuries. But if he did, the statement said, they did not occur as a result of the arrest. Even if the injuries resulted from the arrest, the statement said, "they arose from the use of reasonable and necessary force" to lawfully arrest El Hallak "who was not co-operative." The constables say they did not submit misleading or deficient notes and deny all other allegations made in the statement of claim, as do their co-defendants. Police confirmed Downing continued to work on patrol after investigators ruled there was enough evidence to proceed to a disciplinary hearing. He is charged under the Police Act with unlawful or unnecessary exercise of authority, discreditable conduct and deceit. Talvio is charged with deceit. At his 2015 disciplinary hearing, Downing was found guilty of misconduct and unlawful or unnecessary exercise of authority, Edmonton police have confirmed. He was reprimanded and docked 20 hours of banked overtime. Documents from that hearing show Downing, who was with another officer, drove a police van alongside a 22-year-old suspect who was smoking a joint. Police twice told the man to stop walking. The man, referred to by the initials C.D., took off toward a chainlink fence, the documents say. Downing drove the van over the sidewalk and knocked down a small tree before hitting a fence post in an attempt to cut the man off, the hearing decision said. "Mr. C.D. 's ankle was broken as a result of the van striking him," said the presiding officer, retired Court of Queen's Bench Justice Mel Binder. "The break resulted from a great deal of force applied to it." Binder described Downing's actions as a "significant error in judgment" and suggested a reasonable person in the same situation would have likely determined that the use of the van was inappropriate. "The van weighed 9,500 lbs, and as such was a potential lethal weapon," Binder said. "Mr. C.D. was simply smoking a marijuana joint; he was not a fugitive on the run from committing a murder or a bombing."